My dog is 6 mths old. I rescued him from a shelter after his owner was killed in a car accident leaving behind 4 puppies. He was one of the fortunate one to be adopted. His name is Rocky and he loves to be pampered here he is wrapped up in a towel after a hot shower. Hello Saheed. I really appreciate you coming by today. Thanks so much for taking the time to share with us your own personal German Shepherd puppy story. 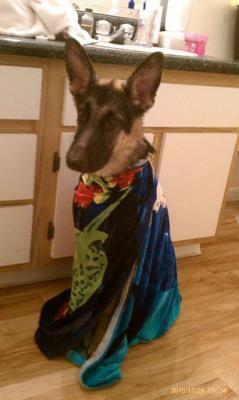 And also that great picture of your beautiful German Shepherd puppy Rocky with us here too. And what a great picture of Rocky you have sent in too. He looks so comfortable and relaxed there all wrapped up in that towel - just like he has just conquered that big old bath and is waiting for his next challenge - the blow dryer?! Beautiful pic. Aww that's a great story! I'm glad he went to such a good home. He's so handsome.